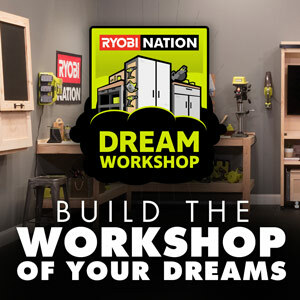 Organization is my love language, but how do you stay organized when you’re working outside of the workshop? I’m working on a really fun collaboration project with the Shanty 2 Chic sisters (more on that soon!) 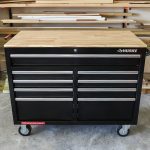 that will require me to travel a few hours from home, so I’m going to need a way to easily transport my tools and materials. 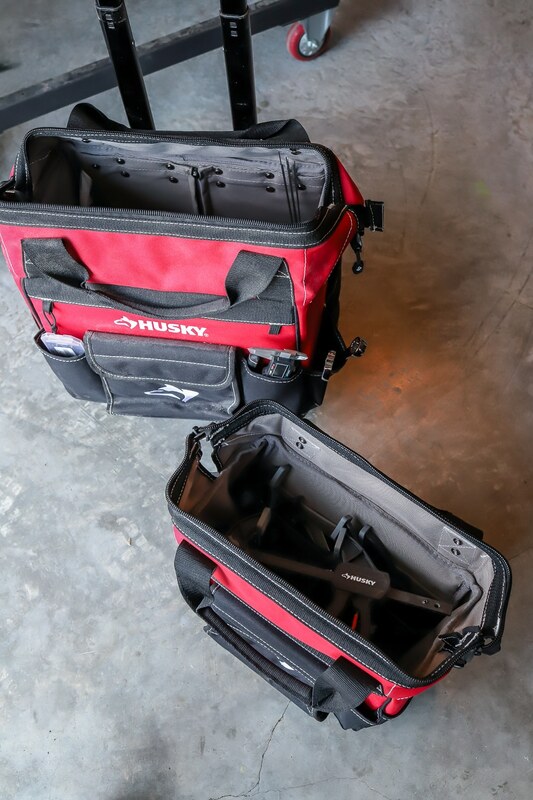 Enter the new Husky 14-inch Rolling Tool Tote. 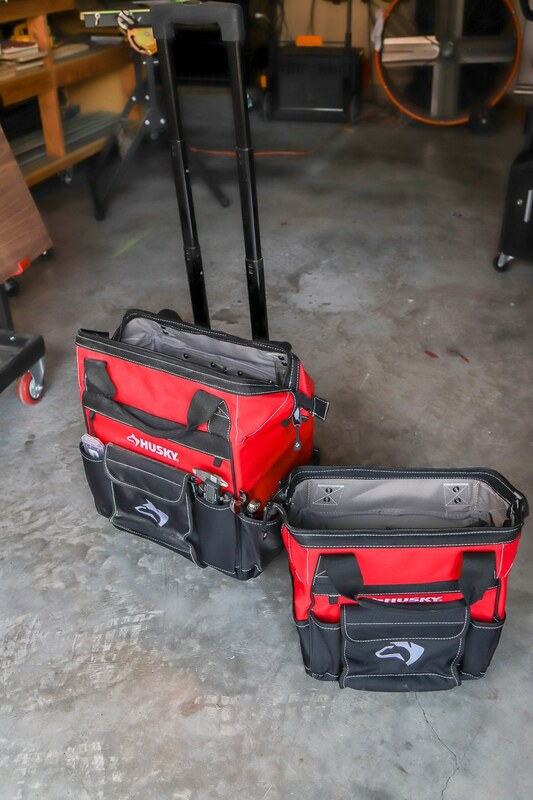 This rolling tool bag is great for being on-the-go. 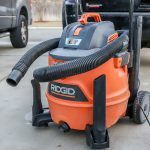 It features a telescoping handle with 2 heavy-duty wheels for easy mobility and the large main compartment provides easy access to tools and accessories. It has THIRTEEN storage pockets to keep me organized. 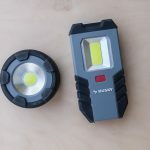 It’s rugged and made with a water-resistant material, so I don’t have to worry that my tools aren’t protected. 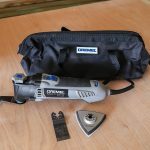 And there’s a bonus 12-inch tool tote that comes with it, with a belt that hooks onto the handle for added storage, ease, and mobility. Another thing I love about this rolling tool bag set is that it opens up wide, so you can see all the way to the bottom without issue. 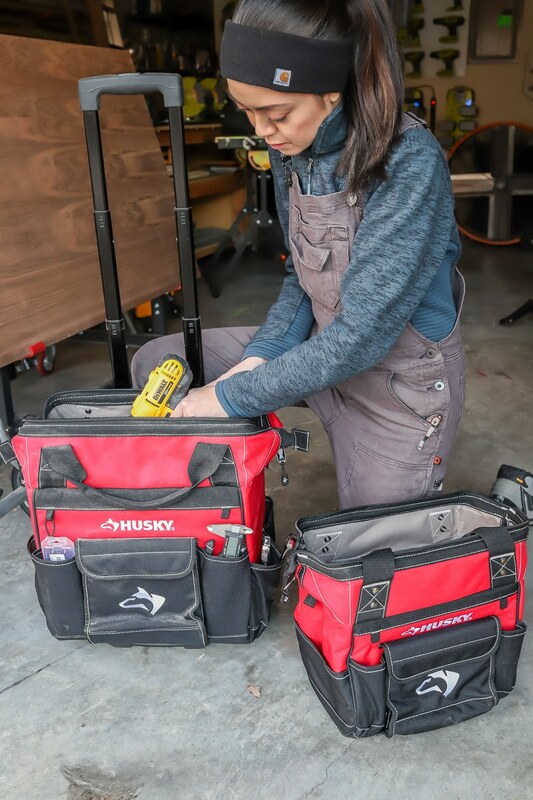 I use the smaller tool bag to store my Husky clamps. 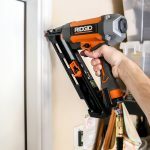 These clamps are a really great deal, by the way – a set of 4 for $10. 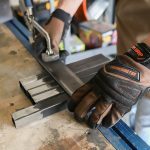 These trigger clamps are really easy to manage one-handed. *Mental note: buy a few more sets of Husky clamps. Check this out: so many pockets for ALL THE THINGS! There are pockets on the outside as well as on the inside of this bag! Here I’ve got my calipers, tungsten electrodes, wrenches, and needle-nosed pliers stashed away. Can you guess what project I’m doing? 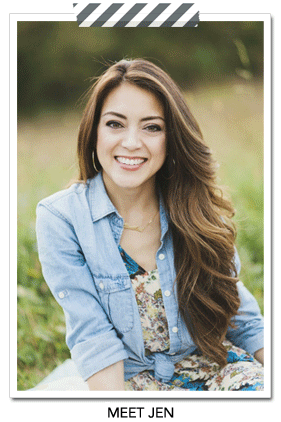 I’ll give you a hint… it involves WELDING! All in all, this rolling tool bag has all the bells and whistles (or nooks and crannies, rather) for working remotely. 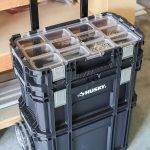 I just fill up the main compartments with my bigger power tools and tuck smaller hand tools in the many pockets. 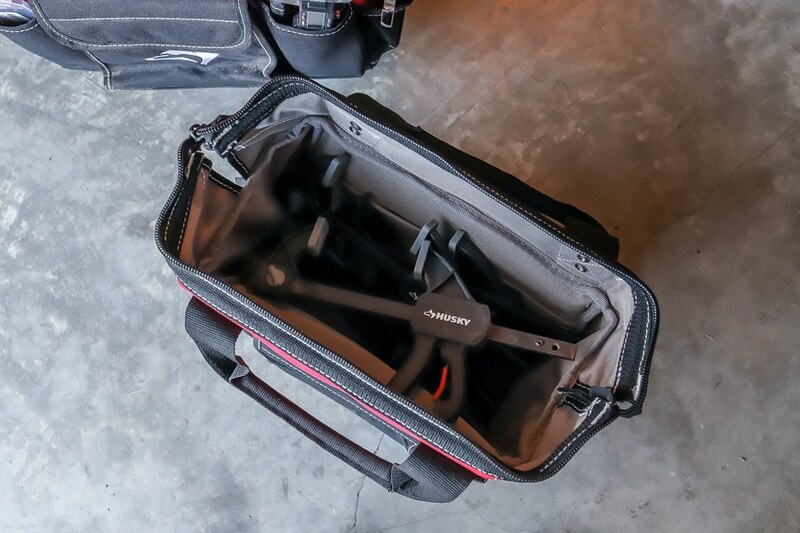 It rolls around easily and has a sturdy handle – the additional bag sits on top of the larger one so I can tote everything one-handed. I’m really happy with it and can’t wait to share my upcoming welding project with you… stay tuned! 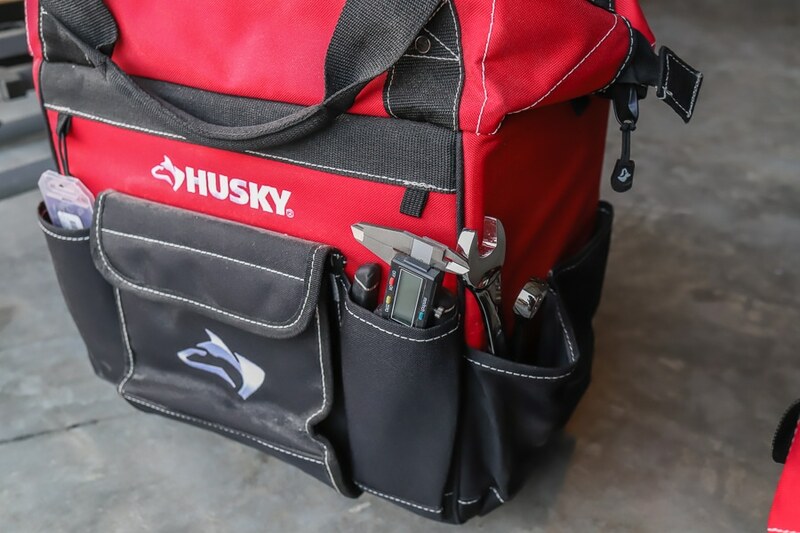 If you’re in the market for a rolling tool bag, check this one out from Husky.